Dev Update 12: Talkin’ ’bout drinking. Rather than just go over this week’s work (which was mainly systems and engine code, nothing glamorous) I wanted to talk about Consumables. Just for clarity, I’m referring to the typical array of items with limited uses that provide an interesting effect. Potions, wands, and scrolls are the most typical, but you could also count ammunition in there as well. They’re a staple of the genre, everyone who can rub two dice together knows about potions of healing and scrolls of fireball. 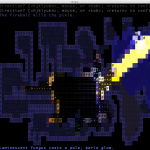 In roguelikes, they’re often mysterious at first. You find a potion, swirling with color, but you don’t know what it does. You can identify it with magic if you’re lucky, or you can just choke it down and hope for the best. Over the last week I’ve been collecting opinons and having discussions with a number of roguelike fans and critics, a number of whom contributed to The Seven Day Roguelike Challenge held a couple of weeks back. What are some of the issues with consumables in games today? The mysterious aspect is the number one feature. Potions can often be dangerous instead of helpful: sure maybe it’s a healing potion, maybe it’ll light you on fire from the inside. Unfortunately, they’re also necessary to stay alive in difficult situations. Using the right potion at the right time is a key part of surviving and winning. However, player’s attitudes towards this are mixed. It’s almost a foregone conclusion that early potions are going to be wasted if you are being safe. On the other hand, it’s fun stumbling across old and forgotten treasures that contain unknown power. Finding that [?Mysterious Sword?] and seeing it become a Mighty Nightsteel Blade of Suffixes + 10 is a great feeling. Dungeonmans is going to approach this from an angle that gives the player the option of passing knowledge from one generation to the next. Upgraded locations such as the Alchemy Lab or Enchantry at the Academy can give new heroes a head start on consumable IDs, with more being revealed as the Academy grows. Players are free to decline this power as well, meaning that those who want to stick to the old ways can do so. When a potion can bring you back from the brink of death, or cause your muscles to burst with incalculable strength, it seems wise to save them for the right moment. Such are the thoughts of many dead Dungeonmens, who let the right moment pass by unknowingly. The hoarding instinct is a strong one, but what most players don’t realize is that games are usually balanced around active use of consumables. Hanging on to them makes early fights harder, and if you hang on to them too long, you’ll outgrow their usefulness. What could help this? Games that employ shops give the player an opportunity to offload unwanted gear, generally allowing them to turn four or five of an item into one that they actually want. Actual Alchemy is another option, letting players mix, match, and dissolve items until they brew the thing they want– or a deadly poison. It is absolutely time to step past the traditional uses of these items and into more interesting waters. 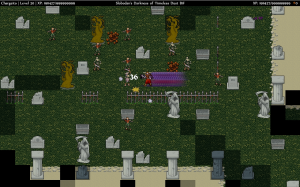 Scrolls and wands are often the methods which roguelikes use to grant additional power to characters, even the tubbiest fighter in the heaviest plate armor can use a wand of speed, levitate or teleport. In Dungeonmans, though, powers like those are part of the mastery system, which means they’re available to nearly any character that’s created. Dungeonmans has a solid collection of “staple” consumables, ones that players expect. But there are also consumables that let you do things you can do in no other way. The most challenging aspect of that sort of development is keeping at least one foot on the ground. There’s a line between creativity and novelty, usefulness and goofiness. Even in the most lighthearted of games, players tend to roll their eyes at the 20th Wand of Comedy they pull up. One option is to combine perks with drawbacks, of which there is no finer example than Morrowind’s Boots of Blinding Speed. That’ll do for today. Many thanks to the bustling roguelike community at the Something Awful forums for joining the conversation. Another busy week here, mostly character development and rebuilding the mastery trees. There’s been a few system changes to the game over the last couple of months so it’s time for me to go back and smooth over the fundamentals. Most of the masteries are existing ones, but there are some new ones, as well as edits that fold two less interesting powers into one. 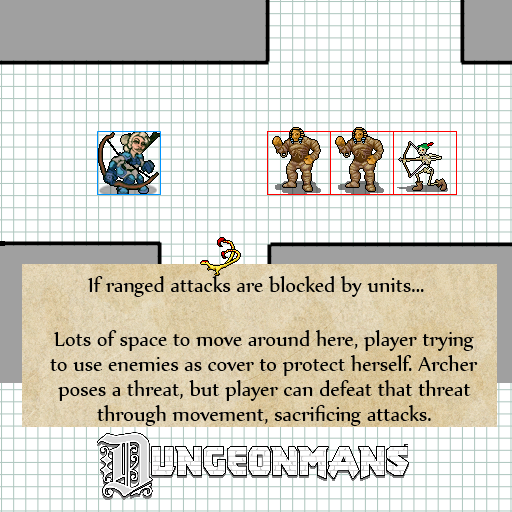 In this case, it would be advantageous to the monsters if units blocked ranged attacks. 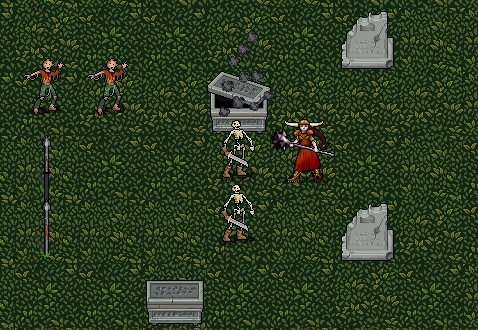 Sure, the Boneshooter can’t get a shot in right now, but neither can the player, and the monsters are free to overtake the player as they move in. 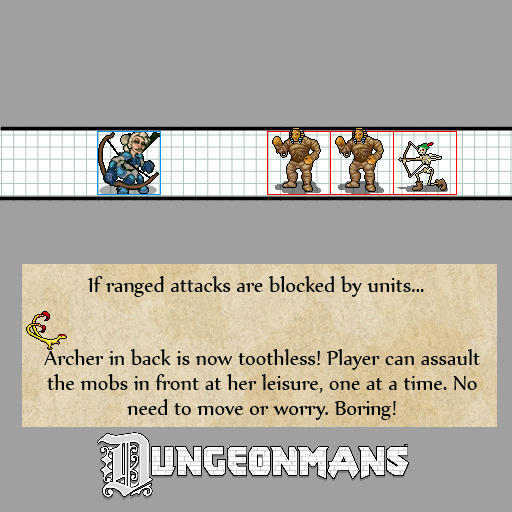 The player might have to hustle to keep the archer out of LOS, but most movement actions (whether you’re just moving one square or taking a jump/dash action) are usually defensive, meaning the player is going to be overwhelmed unless they stop and fight. Advantage: monsters, right? So why not let units block ranged attacks? Well here’s another example. 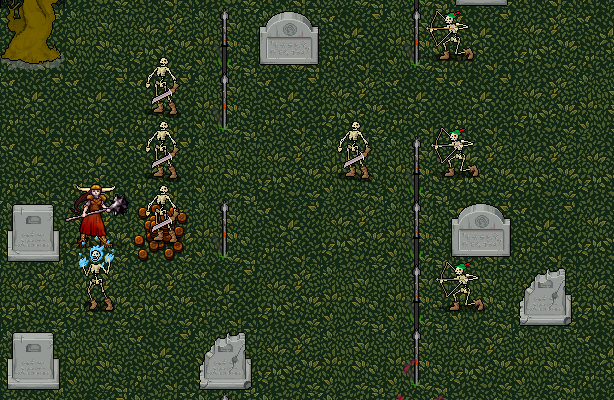 The typical Conga Line Of Death, where the player just hangs out in a hallway and crushes monsters as they just line up to get owned. Boring! All the player has to do is sit here and fire, only worrying about the front line monster, one at a time. To me, this is the most compelling case to let ranged attacks through. The Boneshooter must be a threat, or this setup quickly becomes uninteresting. That’s it for today, back to work! Thanks for reading, and I’d love to hear your comments or questions. Pictures! 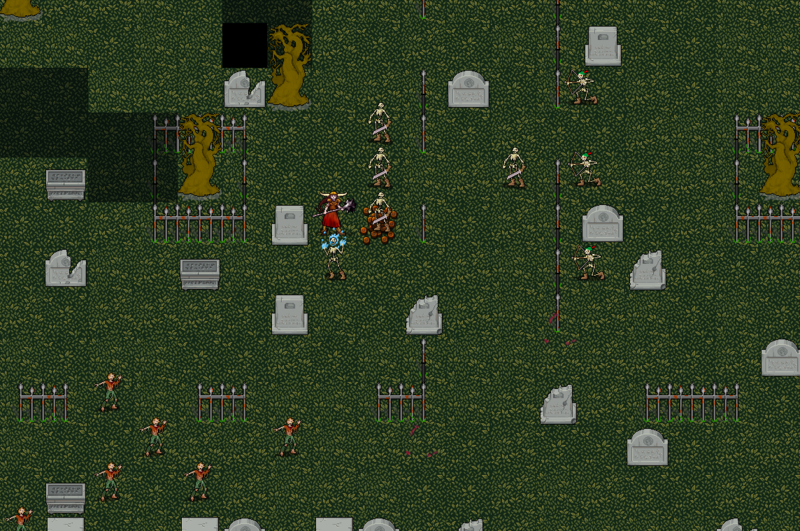 Here’s some shots of graveyard combat in action. Let’s follow Lady Crushfeld VII as she explores a ruin discovered in a shrouded forest. Get to clicking! Surrounded! Well that didn’t take long. Zombies are closing in from the south, and a trio of Boneshooters have set up to the east, behind the iron fence. Note that while the fence blocks movement, it doesn’t block Line of Sight. The trees, however, do so. What to do? Execute a Long Jump and try to get next to those Boneshooters? 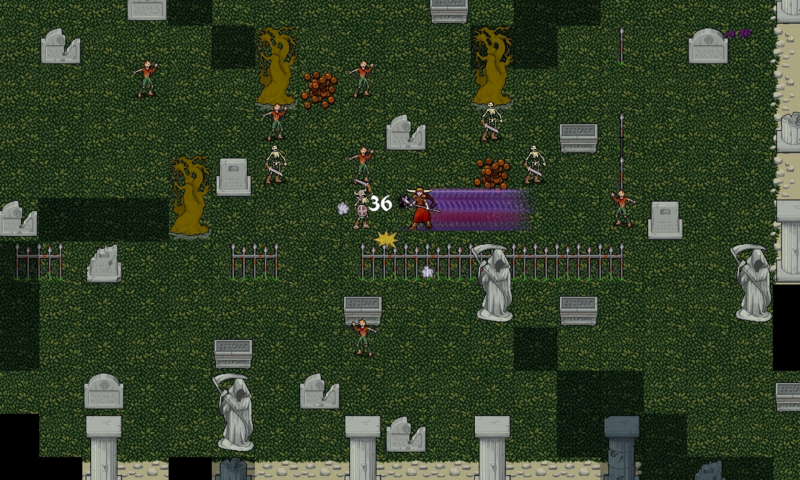 Shield Rush the zombie to the Southwest in order to get distance from the ranged attackers? Or just down a cocktail of potions and start beating the crusty boneshards out of everyone with in arm’s reach while yelling really loud? These are the heavy and ponderous questions one must answer in the rich world of Dungeonmans. 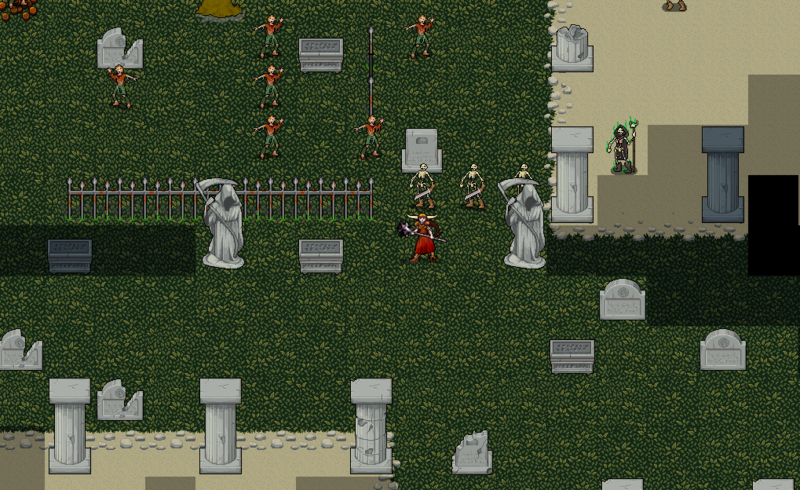 This shot shows Lady Crushfeld VII clearing out some of the fallen temple areas, generally where the good treasure and stronger monsters live. Right in the corner of her vision is a Bone-Damned Apostate, ready to drop all sorts of ruinous green magic on our heroine. 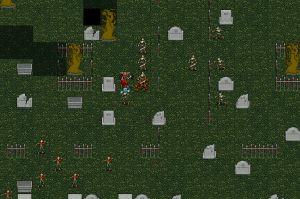 The zombies to the Northwest have to funnel through the single hole in the fence, so she’s got time to maybe take cover behind the statue and clear the skeletons, or just try to make an end rush and get to the Apostate before he starts breaking bad with the really unfortunate spells. Here is a bold action shot, showing our heroine use Furious Assault against a Defeated Captain. Dangerous foes, the Defeated Captains can use Sound the Sundered Horn to buff the strength and speed of nearby undead, making those slow moving Zombies suddenly a great deal more threatening. Let’s nip that crap in the bud right now. Finally, a couple of smaller shots showing off things like the Ancient Cryoscientist firing Icy Graveshards at heroes, and of course the opportunity for treasure in the Graveyards opening up old, dusty coffins and sarcophagi. In other news, there’s been plenty of code written this week and other improvements, but I’m going to keep those in my pocked for the next Thursday update, when I don’t have as many pretty pictures 🙂 back to work! This week has been dedicated to crunching numbers and preparing the little things in combat and equipment. There’s been a big overhaul of how I handle systems like elemental resists, extra attacks, bonuses from gear and status effects. Scrolls are in now, they weren’t before, and wands mostly work. I don’t think the players would mind too much if they never went away from use but that’ll be fixed shortly! In addition, the groundwork for set items and unique named items is in place. Every new campaign will have uniquely generated matching sets of gear, with a variety of bonuses that increase in power as you wear more of the parts. They’ll be quite good, but not mandatory, as the idea of cool set gear becomes a grinding chore when it becomes the must-have armor. 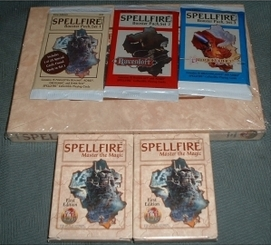 The set bonuses are designed to be interesting and useful as well as powerful. Bonuses to stats and damage are great, but so are powers like finding rings more often in treasure chests, or recovering health every time a monster nearby flees in terror. 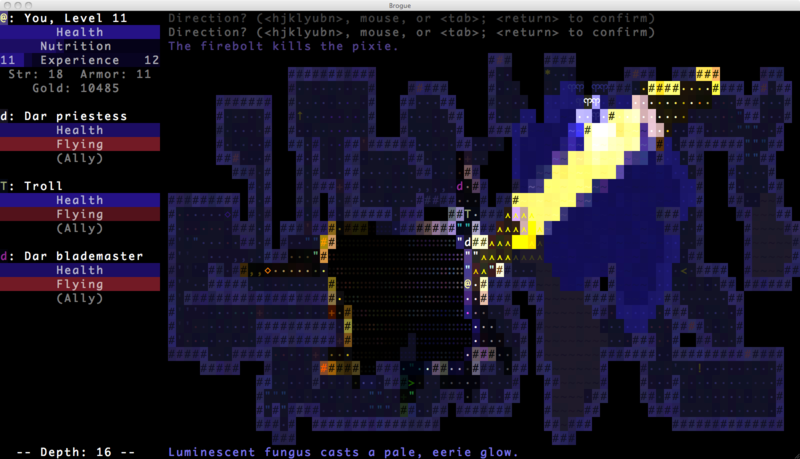 Roguelikes are often equal parts careful character building and making the best of the gear you find; a broad and creative spectrum of gear abilities can only help. No screenshots or art shows, unfortunately. I’m excited about all that’s going on but until I take the time to make it presentable, it’ll have to wait. This is going to be a busy month!